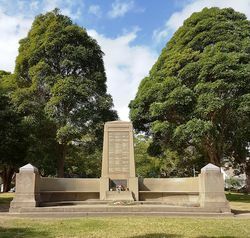 It is in the form of an obelisk that incorporates curved seating, and was the result of an architectural competition drafted and judged by the New South Wales Monuments Advisory Board in 1920. The architect R. Keith Harris won the first prize of 15 pounds with second prize of 10 pounds going to John D. Moore. All arrangements have been completed for the erection in the Annandale Reserve of the memorial to perpetuate the memories of the fallen soldiers of the district. Mr. R. Keith Harris, of Malcolm Building, City, has been awarded first prize for his design of the memorial. At a public meeting at the Council Chambers the executive committee was empowered to request the council to take possession of the funds and carry out the construction of the memorial. This the council decided to do. Evening News (Sydney), 6th July 1920. 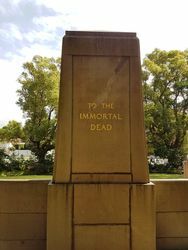 To the accompaniment of pealing thunder, flashing lightning, and pouring rain, a handsome war memorial was unveiled at Annandale yesterday afternoon. It was most unfortunate that the heavy storm broke when it did, as most elaborate arrangements had been made for the ceremony, most of which had to be abandoned, and also that thousands of Sunday-school children and adults were drenched before they could seek shelter. The unveiling was performed by Brigadier General I. G. Mackay, C.M.G., D.S.O., and in introducing him the Mayor (Alderman A. E. Packer, J.P.) said that Annandale was that afternoon again showing its loyalty. Throughout the war the district contributed generously of her men and of her wealth, and since the war had also done her part. 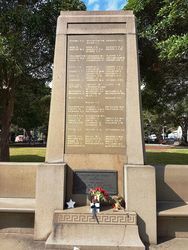 He mentioned that Mr. O. C. Beale had given the beautiful honour roll which had been erected at the Town Hall, and which contained the names of all who had enlisted from the district. The Sydney Morning Herald (NSW), 5 December 1921.